Description: Qoheleth is one of the most challenging and intriguing of the biblical authors. Above all, he is attentive to life's realities, neither optimistic about the world nor unappreciative of its goodness and pleasures. In this volume, Turner examines the writings of Qoheleth in the book of Ecclesiastes and provides an ecological reading of the text that gives readers clear insights into how biblical wisdom literature can be used to respond to the challenges facing the environment in the present day, as well as advancing the field of ecological hermeneutics. In this commentary Turner looks at the concept of Qoheleth's 'eternal earth', moving through the chapters of Ecclesiastes with an ear attuned to the voice of the Earth as it struggles to be heard above the voice of the economy. Such a voice is not necessarily antagonistic to that of Earth, but neither is it neutral. The ecological reader knows that a prudent economy is necessary for living, but if it is given precedence at the expense of Earth, there will be no future, let alone 'eternity', for Earth. Eco-justice demands that contemporary readers should be mindful of future generations and heed Qoheleth's counsel to value the fruits of one's labour without greed, allowing ecological hermeneutics to provide insights into contemporary environmental issues. Illustrating how a biblical framework for environmentally responsible living may be generated, Turner's analysis is vital both to those studying Qoheleth and to those invested in the Bible and ecology. 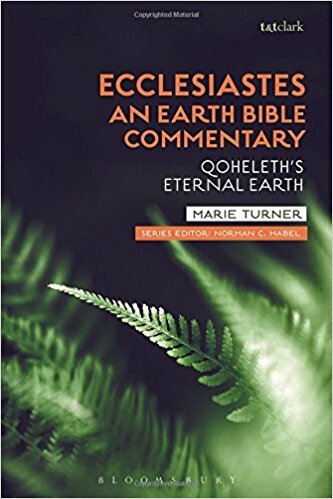 Citation: Timothy J. Sandoval, review of Marie Turner, Ecclesiastes: An Earth Bible Commentary: Qoheleth�s Eternal Earth, Review of Biblical Literature [http://www.bookreviews.org] (2019).